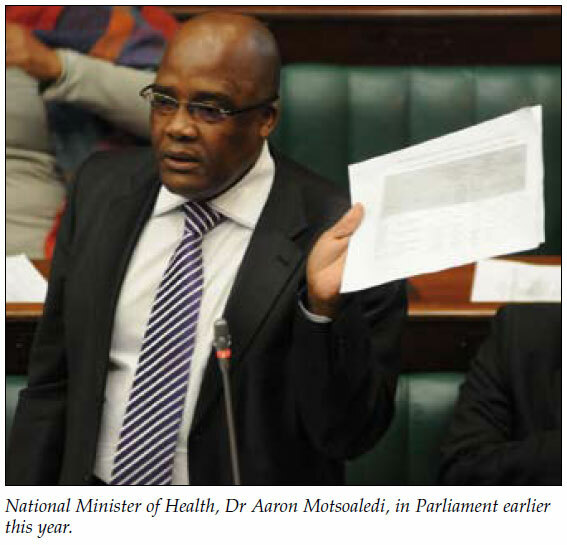 South Africa's health care system has spent the last '10 years pedalling backwards', and needs extensive overhauling if it is to achieve better outcomes, the national health minister, Dr Aaron Motsoaledi, admitted to a conference of rural doctors recently. He said the overhaul had to include management and, although 'intimidating', was now unavoidable. Motsoaledi was delivering the keynote address at the 13th annual rural health conference hosted by the Rural Doctors Association of Southern Africa (RUDASA) at Broederstroom in the North West Province at the end of August. The minister, addressing ongoing RUDASA concerns about a human resources crisis that sees rural facilities staffed by 57% fewer generalists and 93.4% fewer specialists* than those in understaffed urban areas, said he had already challenged medical deans. 'I asked them what government must do to make it possible for them to bring in new students from rural areas, because this is a priority,' he said. However, he conceded that it was becoming increasingly difficult to get 'kids from rural schools' to study medicine because of ongoing problems in education. Motsoaledi believes 'a huge dose of people (health care workers) from the outside (overseas)' is needed to help out while the other fundamental flaws are addressed. The conference strongly endorsed a proposal by RUDASA's student committee that government support programmes mentoring rural learners for tertiary training, publishing guidelines on more equitable health study bursaries and increasing the proportion of rural-origin students admitted to health care sciences. The delegates pleaded with government to engage with tertiary institutions to discuss guidelines for incrementally increasing exposure of health care students to rural and community health and expanding district health campuses into primary training sites. They said a review of international best practice in recruitment and retention of health care workers showed that selecting students from rural areas who had an initial intent to go into rural practice, immersion in rural practice as part of their clinical training and aligning current training with the context of health provision in the relevant country, worked best. Just over 46% of South Africa's population lives in rural areas and receives its health care in rural hospitals and clinics. Motsoaledi, whose speech was described by delegates as 'refreshingly honest', said the government intended improving the entire human resources 'area', including planning, development, management and training of medical students and nurses. 'We have lost the nurses who were trained at the bedside. Part of our plan is about recovering what we have lost. Another thing that went wrong is the idea they had that anyone can run a hospital - that was a big mistake,' he admitted. On HIV/AIDS he said that by 2011 there should be 2.3 million people on antiretrovirals (80% of those needing them). 'That is Mount Everest - we are going to climb it but without oxygen ... we have no option, we must do it. If we don't our health situation will not improve' he said, adding that task shifting was at the core of the government's new approach. His deputy, Dr Molefi Sefularo, told an audience at the launch of the University of Witwatersrand's Centre for Rural Health that more senior doctors were needed to supervise more community service doctors in the neediest of rural hospitals. Speaking two weeks before the minister, Sefularo highlighted the need for better integrated service delivery through co-ordination and resource deployment by government and other stakeholders, plus bolstering rural local government capacity. The new Wits Centre, headed by Professor Ian Couper, will focus on becoming the 'peak academic body' in the field of human resources for rural health. The plan is to do this by facilitating education and training of current and future health care workers and supporting recruitment and retention of staff via research, advocacy and policy development. This honing of academic direction was decided on to complement the work already being done at similar rural centres (undergraduate education at Stellenbosch University and research at the University of KwaZulu-Natal). Sefularo revealed that national government, working with the provinces, had identified 18 rural districts as 'deprived' (poor access to health services) and would be prioritising them. Provinces were being encouraged to build the key elements of the national rural health strategy into their annual performance plans with a clear focus on strengthening district health management teams through capacity-building audits 'right down to facility level'. 'But clearly if we do not have adequate and correct human capital, our brilliant plans will amount to nothing', he added. Government looked forward to working with the Centre to devise and refine the most effective health care improvement strategies, the role of academic institutions and adjusting for the optimum skills mix at clinics, hospitals and rural districts. It would also listen keenly to what the Centre believed were the best methods to achieve recruitment and retention of health care professionals in rural areas. Professor Couper urged government to further probe the salaries of rural practitioners, highlighting concerns that rural allowances might actually decrease in terms of the recently concluded Occupation Specific Dispensation (OSD) negotiations. Mid-level category doctors, so vital to supervision in rural areas, received the worst OSD increases, but may get supplementary hikes in April next year after category-specific negotiations are re-opened in terms of the settlement. Couper warned that Medical Officers and Senior Medical Officers made up the bulk of people staffing rural hospitals, 'so actually it's a very rural unfriendly package that is being put together'. He said that since the establishment of the Wits Centre for Rural Health was first approved by the university authorities in 2006, it had partnered with North West Province and the first rural medical student recruits would graduate at the end of the year. A second partnership with Mpumalanga Province is imminent. Couper revealed that 25% of third-year medical students at Wits now chose rural electives with opportunities for rural exposure in years 3 - 6 of the curriculum. A district educational campus had been established at Lehurutshe hospital near Zeerust (NW Province) while postgraduate training opportunities now existed (e.g. Master's in Public Health in rural health and a proposed Master's in Nursing in rural health). A rural health advocacy project, combining the resources of the AIDS Law Project, RUDASA and the Centre, had also been set up to promote justice and equity in rural health. * There are 13 generalists and two specialists per 100 000 people in South African rural areas versus 30 generalists and 30 specialists per 100 000 people in urban areas - Wits Centre for Rural Health Research.